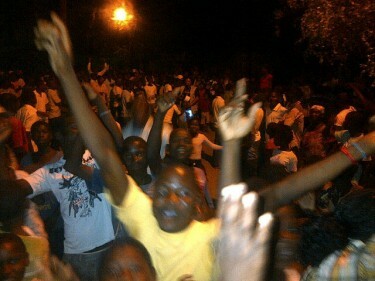 Last night, December 7, even before the official results of Mozambican mayoral by-elections, supporters of opposition candidate Manuel de Araújo were celebrating on the streets of Quelimane and online across the country. De Araújo's party MDM, or Democratic Movement of Mozambique, a spin-off from historic opposition party RENAMO, was running in all three cities with by-elections: Cuamba, Pemba and Quelimane. (RENAMO refused to stand in these elections.) Frelimo, the party governing the country since independence and dominating its politics, maintained power in Cuamba and Pemba. But all eyes were on Quelimane, the largest of the three cities, with the most charismatic opposition candidate. Quelimane is a city of 200,000 people, the seaport capital of central Zambezia province, known for its agricultural potential and increasingly strategic location, with coal companies looking to transport coal by river to sea. Araújo's party MDM has a small representation in parliament, but the party started with the mayoral victory of founder Daviz Simango in the city of Beira. MDM was born out of municipal politics – a fact that drew even more attention to the contest in Quelimane. Araújo campaigned in ways unheard of in recent times in Mozambique. He has been blogging for over four years, and he also used Facebook effectively to gather support from professionals and young people online. His “Quelimane for all” page had over 2,700 fans, and was reporting events during the vote in realtime to supporters, including electoral violations. During his campaign he created a bicycle rally with bicycle taxis and a mass march. While he was criticized by some for always appearing in a blue shirt, some argued he was simply “branding” himself given that his time on state (and even private) TV would be limited and that his party and its symbols are relatively new to voters. Independent sources confirmed that the election day was marked by police intimidation and the arrest of one of MDM's youth leader in Quelimane, as well as an incident later in the day in which two MDM supporters were allegedly beaten up. But a couple of hours after polls closed, as the polling stations made their public first count of the votes, crowds gathered outside to keep the pressure on electoral officials. The atmosphere was tense initially, with heavily armed riot police ringing the stations. 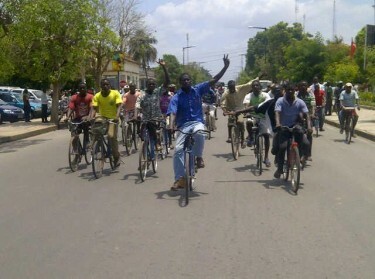 But people would not be deterred, as photos tweeted by @ Verdade newspaper journalists confirmed in realtime. QUELIMANE EM FESTA COMO SE FOSSE VIDADA DE ANO… Que se passa? QUELIMANE IS PARTYING LIKE IT'S THE NEW YEAR… What is up? Frelimo spokesman Edson Macuacua announced shortly after on his wall that he recognized preliminary results announced by the media indicated a win by Manuel de Araújo. Nao ha fraude nem estrategia politica que contrarie a vontade colectiva de mudancas…afinal eh possivel, com um papel e caneta mudar-se o curso do rio dos bons sinais. A democracia agradece!!!!! Viva a Vitoria!!! There is not fraud or political strategy that can go against the collective will for change… in the end it is possible, with pen and papers to change the course of the Rio dos Bons Sinais [the river that runs past Quelimane]. Democracy is thankful!!!! Long-live victory!!! nos fizemos a nossa parte, nem a presenxa dos tubaroes k se fizeram presentes na nossa cidade, conseguiu influenciar a nossa mente e desta a freli nunca ira se eskecer, MANUEL DE ARAUJO, eu mais do k tu, to feliz…. Antes de ir dormir kero congratular ao Manuel de Araujo pela victoria e dizer levem em frente Quelimane que a joventude esta contigo e dizer que essa victoria nao é só sua mas tambem de todo povo morador de Quelimane em especial os jovens. Before I sleep I wanna congratulate Manuel de Araujo for the victory and say take things forward in Quelimane, the youth are with you and to say that the victory is not just yours but also of the people who live in Quelimane, especially young people. QUELIMANE | MANUEL DE ARAUJO | MDM – Cesar toma o que é teu!! QUELIMANE | MANUEL DE ARAJO | MDM – Render unto Caesar that which is his!! #MDM arranca #Quelimane da #FRELIMO. Damn. #MDM snatches #Quelimane from #FREMIMO. Damn. Frelimo candidate Lourenço Abubacar formally conceded defeat on state radio and his campaign's Facebook page was taken down today, the day after the vote. Later in the afternoon the state electoral commission announced the result in record time, confirming Araújo's win.